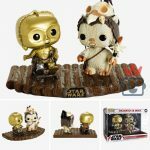 Open your wallets and get ready for the March release of the next wave of Star Wars Funko PoP! figures. 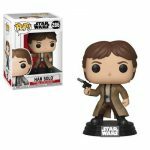 Thankfully Funko has slowed down the release of its Star Wars releases to help ease the burden on our wallets and shelf space. While I say “thankfully”, I still want more. Can we ever get enough of these to fill our collections? It appears that Target might be the exclusive store of choice in this release. We all are aware of the horror stories that result from Target exclusives. From store employees holding the exclusives for themselves to resell later, to exclusives being placed on the shelves earlier than their scheduled release dates, to the worst Target not having the item in their storeroom on the day of release. Hopefully, there will be the option to grab these online with either store pickup or free shipping to your local store for pick up at your leisure. Either way, you look at it though, I am excited with this set and can’t wait for its release. I’m sure the common PoP! figures from this collection can be found at all your typical stores that sell Funko PoP! figures. Now let’s take a closer look at what is planned for release. 1.) 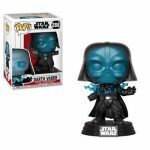 #288 Darth Vader- I’m excited about this figure. Glow in Dark! Darth Vader is being electrocuted and his helmet is alight with electricity. This figure just makes me gitty with excitement. I think it is a proper use of the glow in the dark vs having the whole figure being glow in the dark. Full figure glow in the dark is only good for spirit figures and then, in my opinion, it is stretching it. 2.) 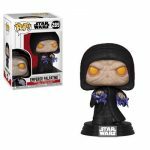 #289 Emperor Palpatine-This is the figure you need next to Darth Vader as he is getting electrocuted. The pair here will create a nice movie moment set up without the added cost and taking up less space. Emperor Palpatine just looks plain evil here. I like the eyes, something they did recently with Anakin. 3.) 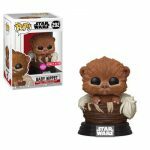 #293 Wickett W. Warrick – A 10-inch Ewok, who can’t get behind that? Though I’m not sure how or where he will fit in with the collection. I guess he will just chill beside the 10-inch Porg in my collection. I like how they went with a different box number for the 10-inch vs the normal size figure. It really irked me the way there were multiple different versions of the Porg with the same box number. I get variants having the same box number but to have a 10-inch version with the same box number is pushing it. figures. While not a largely known character from the movies. We need to see a baby Ewok and should have seen it sooner in my opinion. 5.) #287 Princess Leia- We need more Princess Leia in our life. We need more people doing what’s best for the galaxy, fighting the hard fight. Seeing the scene of Princess Leia out of her normal wardrobe and into something that appeared more relaxing and comfy just made you think that the war was over and people could get easily fall back into a “better” time in their lives. We never knew what we had coming back in 1983, did we? 6.) 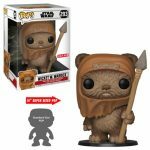 #290 Wickett W Warrick- Now I know many people are going to complain because we have had a Wickett before, box #26, and we want to see “new” stuff, not just reissues of older figures. I get it I do, however, there is something more natural about his attire with this figure. I like him, he seems less cartoonish with this release. Plus he has a different stance than the previously released figure and the 10-inch version in this set. 7.) 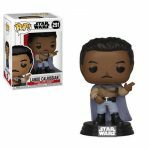 #291 Lando Calrissian- I still like the Solo movie version of Lando better but basically this is an update release of the previous Lando, box #30. But like I mentioned above this figure looks less cartoonish than the previous release and you can catch some of Lando’s style with his cape draped to the right. This figure also fits better with the Solo version. This looks like an older version of Lando when compaired to the Solo version and I think that is appropriate. The first release, #30, and the Solo version just did not match up. #8.) Han Solo- Lastly Han Solo makes my list as my least favorite in this set. How many Han Solo figures must be endured with a similar pose. There is nothing to this figure that stands out to me, that makes me want to run out and grab it as soon as it hits the shelves. This is the first figure I predict going on clearance to get the stocked moved. 9.) Movie Moments- I collect them because I’m a completionist but I’m not and have not been a huge fan of these. That’s all. Sound off in the comments your list of the new PoP! figures.